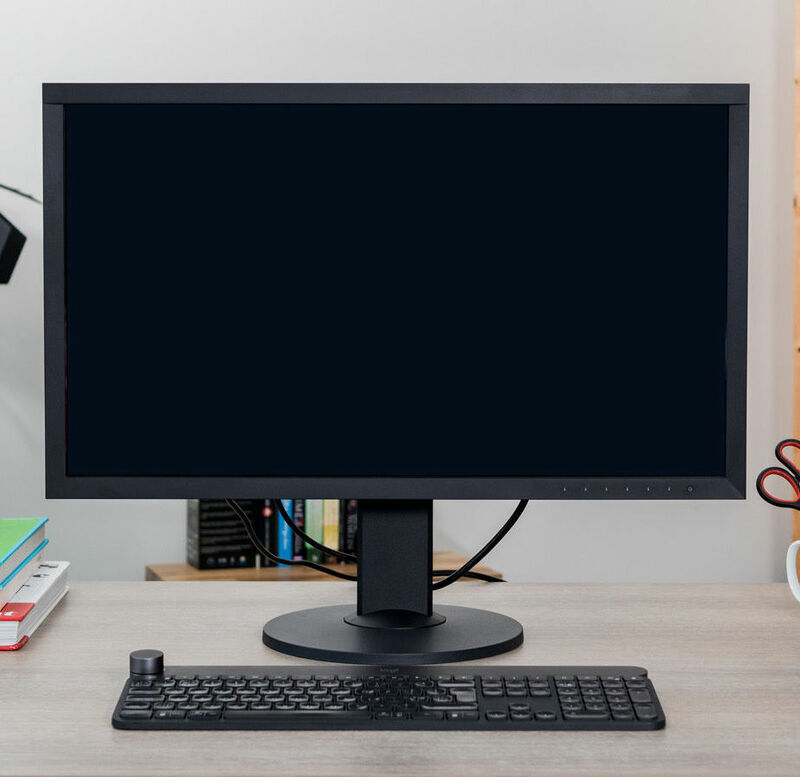 Eizo has been a brand on our radar for a while now as a trusted name in high-end monitors, a maker which recognises the needs of artists and designers looking for the right sort of display as part of their creative setup. 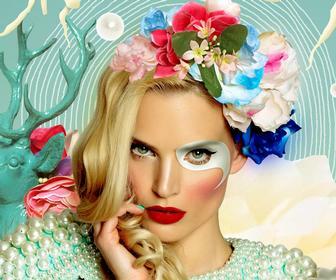 The ColorEdge CG2730 LCD monitor continues in that tradition, released as part of the premium Colour Grade (CG) series. 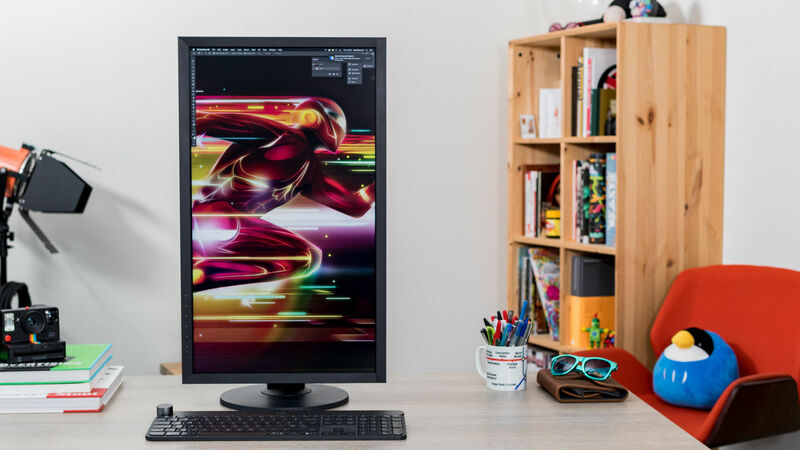 The unit impresses out of the box with its dark bezel and stand; this is what you want from a monitor , a dark design that brings out the best of your colours instead of clashing with them. Even more impressive is that there’s no logo here, ridding you of yet another distraction (something which direct competitors like Lenovo and Dell could take note of). The accompanying hood with our unit is also of the same shade, of course, and comes with magnets in its folds to be easily attached to your display. We say easily, but a fair few of the Digital Arts team did find it rather fiddly to attach. Also in the box is your factory calibration certificate, meaning your CG2730 is ready to use from the box. You also get an LCD utility disk with ColorNavigator to install, but this was something we left to one side as we were using the latest Mac Mini as our workstation. There’s a supplement of four leads in the box: a DVI dual-link cable, a DisplayPort cable, and USB 3.0 cord and power lead. You also get mounting screws in case you want to attach the display elsewhere. To detach your monitor from the stand requires an easy push of a button at the back of the stand. There’s an impressive amount of ports to attach both your new leads and most used accessories. The Port hub is below the lower edge of the screen meaning you can keep everything tidily at desk level. It carries five ports total: DVI, HDMI and a Display-Port that can take both standard and mini DisplayPort leads. You can also attach Thunderbolt leads to carry audio/video data (but not energy for charging your attached device; for that option, look towards the Lenovo ThinkVision P32u monitor with its Thunderbolt ports). 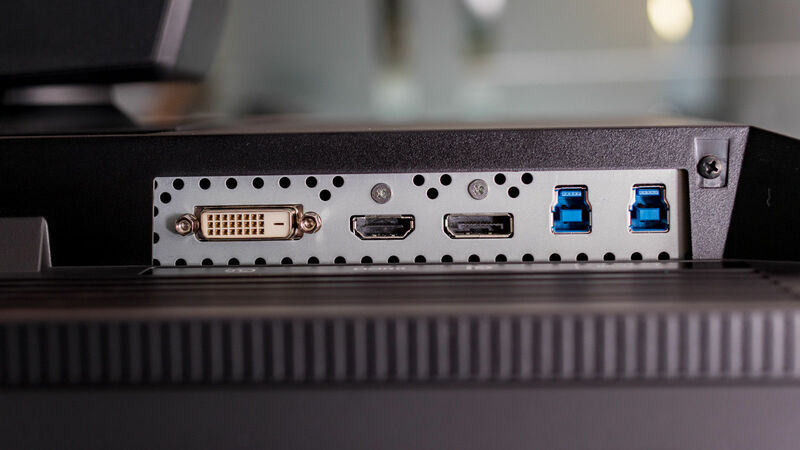 The other two ports on the hub are two upstream USB ports, a nifty inclusion as this means you can attach two workstations without needing more than one keyboard and mouse in your set up. A nice capability in our eyes. 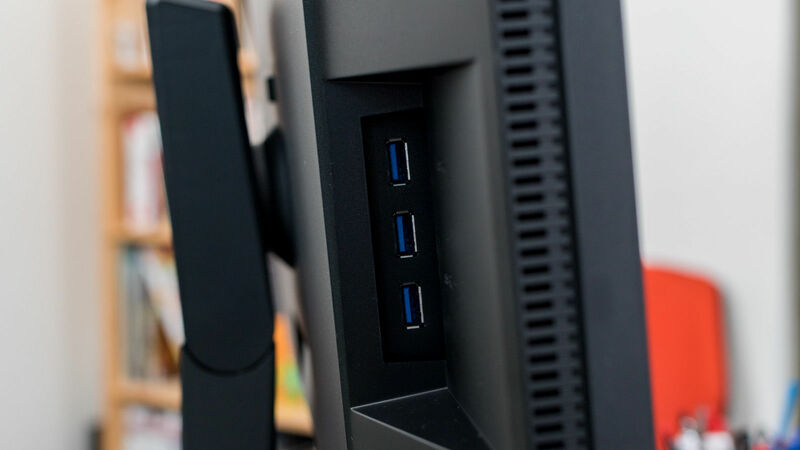 But there’s more - three more USB ports can be found on the Eizo's side, perfect for all your outer connections; weirdly, though, these aren’t mentioned in our manual, so make sure you don’t overlook them upon unboxing (unlikely, but you never know). 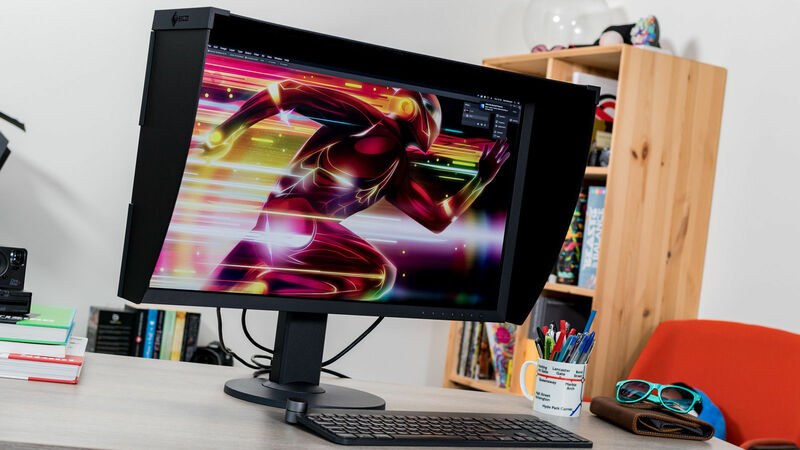 Running our tests with a DataColor Spyder5Elite which uses 48 colour swatches as part of its examination, we were deeply impressed by the Delta-E rating of 0.47 (especially as many monitors score a DE closer to one or above). It also matched the 2.2 gamma curve, meaning you can trust the CG2730 for colour accuracy. If in doubt, note that we pulled a 100% Adobe RGB from our tests. We also calibrated the monitor using the Spyder5Elite before testing for optimum results. This means we did not test the factory calibrations by Eizo, nor the self-calibration on offer by the screen. For comparisons, we ran the same tests on the latest Macbook Pro from 2018 and the iMac 27 inch 2017 model, calibrating both with the DataColor for optimum coverage. The Eizo monitor easily won out against both in RGB, with the iMac coming out with 92% and the Macbook Pro at 86%. Its Delta-E ratings also scored higher than the iMac (0.68) and Macbook Pro (0.66). 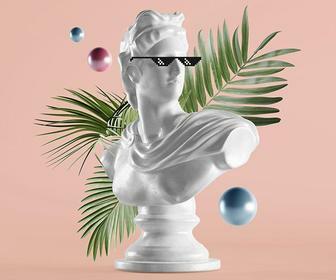 Be aware that if you're without a DataColor device, you can rely on the self-calibration sensor that’s inconspicuously hidden in the top rim of the monitor's bezel. The sensor can be deployed to calibrate both monitor and graphics card weekly, monthly or at any time of your choosing quite easily using the bezel-based buttons and corresponding menu. Those buttons light up with a nice little glow but you can switch these illuminations off using the menu, too. The same menus also let you edit your calibration settings - so, if you want to switch to your Video Output specs, you can name that mode to reflect that as opposed to something more generic like ‘Output 3.’ Nice to know. Creative folk everywhere with more than one device will be happy to know Eizo’s Quick Color Match will share your specs across screens. You’ll also be able to import DataColor gathered-specs from other devices using the screen’s Target Management menu. 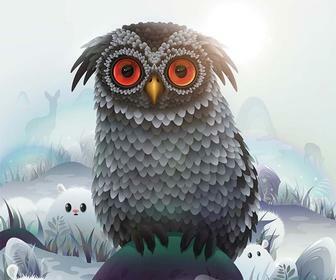 Also note the resolution is a brilliant 2560 x 1440 with an equally dazzling brightness at 120 candela. Contrast ratio stands at 1500:1, also recommended. There’s a DCIP3 output of 98% too, great for digital video projection, and the whole screen comes equalised for display, which is good to know as LCD monitors by nature can decrease in quality around the screen and extremities. It takes a good grip to adjust the CG2730, but it’s a nicely flexible monitor. The monitor can be lifted as needed to under 16cm in height, and can bend forward 5 degrees, and backwards 35 degrees. In horizontal mode it can spin from left to right to a measurement of 344 degrees - and yes, you can tilt it 90 degrees to make your monitor a vertical screen to do your work on. The CG730 can also be easily carried thanks to a space on the back of the monitor above the stand’s peak. It won’t be too heavy on the arms, either. Finally, we like the nice cable holder at the base of the stand, keeping your workspace nicely free of tangles. With a 100% RGB coverage, the Eizo CG730 already stands out in an oversaturated market. 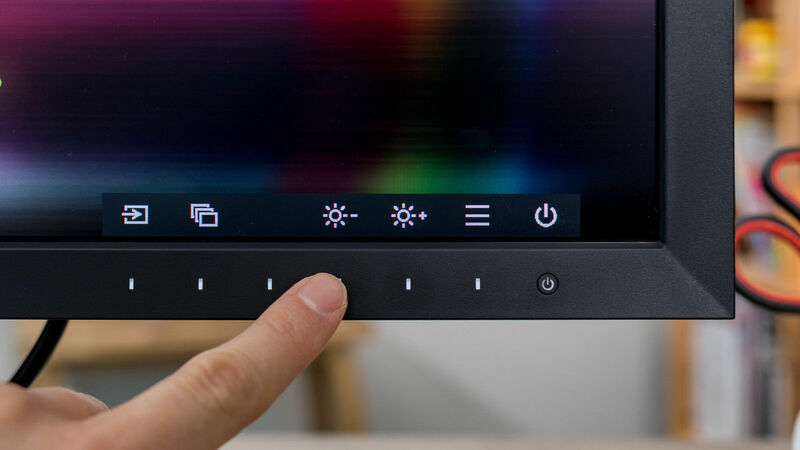 It's the little details though that make it a 5-star monitor - the completely black bezel, the self-calibrating sensor, its splendid port options. It's direct competitors on the market would be the same sized Dell UP2718Q, and the bigger Lenovo ThinkVision P32u. The Eizo beats both by having something they don't have with the sensor. It also has a lower Delta-E score than either. 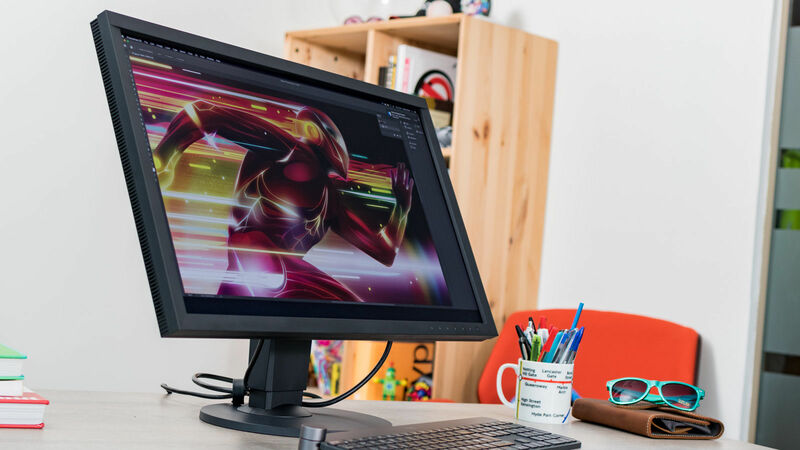 If you still want something bigger with Thunderbolt ports, the Lenovo is for you, but the CG730 still stands stronger on the nitty gritty visual specs - colours pop, shades look great in Photoshop, and at the end of the day that's what you really need as a visual creator.